Explore the refreshing taste of vegalino tea beverages! 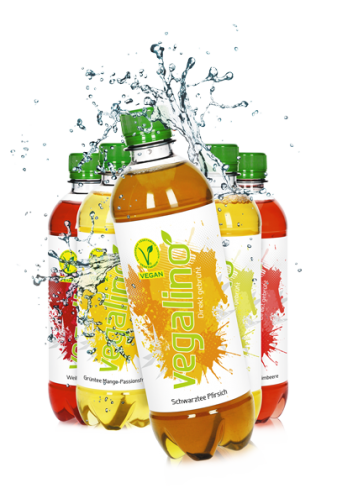 vegalino beverages are certified with V-Label by the Vegetarian Foundation Germany (VEBU). 100 % vegan – from ingredients to packaging. vegalino tea consists of freshly brewed tea with fruit and little sugar. 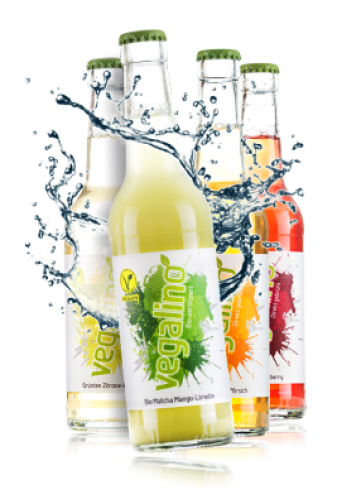 vegalino beverages are produced on the most modern filling-lines in Germany. Labels contain vegan glue. The sealing mass of the crown corks is vegan. Made in Germany. We refine popular classics with a fruity touch and we designed new beverages with innovative ingredients. Extremely delicate – taste all of them! Matcha is the queen of the green teas and one of the oldest tea type of the Japanese tea ceremony. The rarest tea in the world is originating from the best leaves of the tea plant and shall be deemed to be energizing and antioxidant. Our matcha tea is pure green tea in powder form from grated matcha-leaves. Our innovative organic vegalino matcha tea mango-lime combines green tea in powder form with exotic mango and lime. Please shake well before use. Organic certified. Certified with V-Label by the Vegetarian Foundation Germany (VEBU). Labels contain vegan glue. 330 ml glass bottle. Sealing mass of the crown corks is vegan. Black tea is stimulating body and mind. In vegalino black tea peach we combine the aromatic taste of the freshly brewed tea with the mild fruity taste of peach. Organic certified. Certified with V-Label by the Vegetarian Foundation Germany (VEBU). Labels contain vegan glue. 330 ml glass bottle. Sealing mass of the crown corks is vegan. White tea is a natural tea specialty. The handpicked leaf buds are mild dried. In vegalino white tea cranberry we combine the freshly mild brewed tea with the fruity herb taste of cranberry. Certified with V-Label by the Vegetarian Foundation Germany (VEBU). Labels contain vegan glue. 330 ml glass bottle. Sealing mass of the crown corks is vegan. The natural leaf color of the green tea is widely conserved, because it is not fermented. In vegalino green tea lemon-lime we combine the aromatic herb taste of the freshly brewed green tea with sun-ripened citrus fruits for a freshly taste experience. Certified with V-Label by the Vegetarian Foundation Germany (VEBU). Labels contain vegan glue. 330 ml glass bottle. Sealing mass of the crown corks is vegan. Black tea is stimulating body and mind. In vegalino black tea peach we combine the aromatic taste of the freshly brewed tea with the mild fruity taste of peach. Organic certified. Certified with V-Label by the Vegetarian Foundation Germany (VEBU). Labels contain vegan glue. 500 ml bottles with practical screw plug. White tea is a natural finish tea specialty. The handpicked leaf buds are mild dried. In vegalino white tea cranberry we combine the direct freshly mild brewed tea with the fruity herb taste of cranberry. Certified by V-Label from the Vegetarian Foundation Germany. Label with vegan glue. 500 ml bottles with practical screw plug. The natural leaf color of the green tea is widely conserved, because it is not fermented. In vegalino green tea lemon-lime we combine the aromatic herb taste of the freshly brewed green tea with sun-ripened citrus fruits for a freshly taste experience. Certified with V-Label by the Vegetarian Foundation Germany (VEBU). Labels contain vegan glue. 500 ml bottles with practical screw plug. Rooibos tea is the national drink in South Africa. The reddish color and the tastiness comes from the fermentation of the rooibos leaves. In vegalino rooibos strawberry-raspberry we combine the typical taste of rooibos with the red fruits of strawberry and raspberry. The rooibos tea is freshly brewed. Certified with V-Label by the Vegetarian Foundation Germany (VEBU). Labels contain vegan glue. 500 ml bottles with practical screw plug. The natural leaf color of the green tea is widely conserved, because it is not fermented. In vegalino green tea mango-passionfruit we combine the aromatic herb taste of the freshly brewed green tea with excotic mango and passionfruit for a freshly taste experience. Certified with V-Label by the Vegetarian Foundation Germany (VEBU). Labels contain vegan glue. 500 ml bottles with practical screw plug.